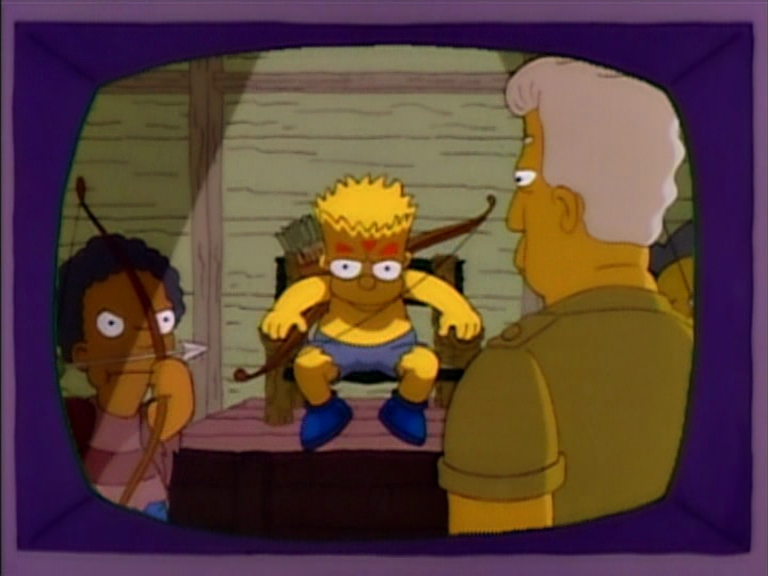 In previous instalments, I’ve raised the question of who exactly The Simpsons’ lead character is, particularly in terms of the struggle between Bart and Homer. Here in Season 4, a new star steps into the spotlight: Springfield as a whole. The closest The Simpsons ever came to gaining a spin-off, as far as I can tell, was “Tales from Springfield”, an anthology show which would focus on different members of the supporting cast each week. Although that idea wouldn’t emerge for another couple of years, its roots are in this season. Episodes start to take full advantage of the show’s incredibly deep bench, whether it’s Barney as the Plow King, Ralph getting his heart broken, or Krusty making a comeback after his show is cancelled. 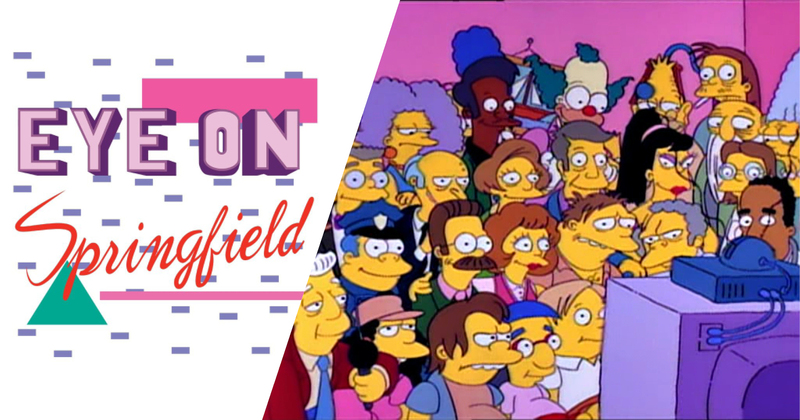 Jokes get divided up not only between the core family but the whole town, and there’s even the odd episodes where the amalgamated residents of Springfield essentially fill the protagonist role. For an example, you need look no further than probably the single most celebrated episode of this season. It might be billed as “Marge vs. the Monorail” (4.12) but really, it’s a story of the entire town being tricked by con man Lyle Lanley. To support this, Springfield in Season 4 is – as a later episode would put it – a city on the grow. New landmarks are being added almost constantly. Duff Gardens, Widow’s Peak (not even the town’s tallest mountain), the Escalator to Nowhere. It really starts to feel like a place with its own mythology and traditions, whether it’s the rivalry with Shelbyville or the (dubiously) Jebediah Springfield-founded Whacking Day. 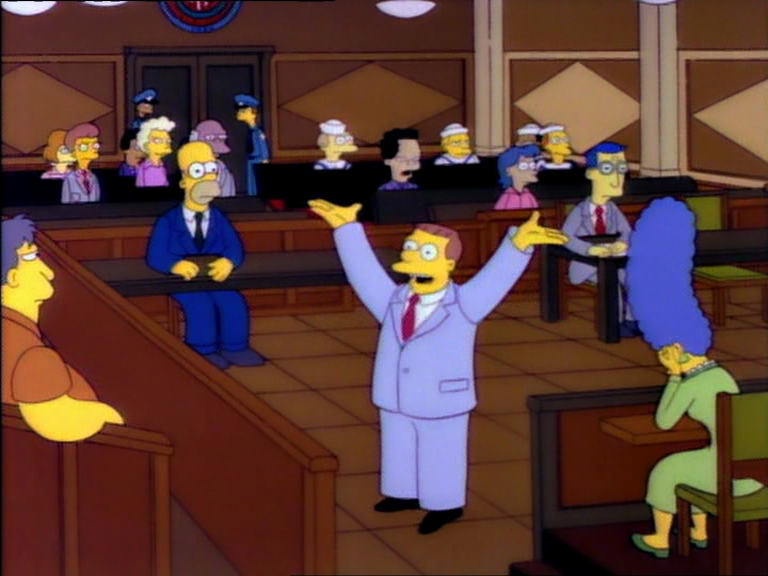 Of course this is a town with its own mafia – Springfield is an effectively infinite place. It is also an increasingly dumb place. 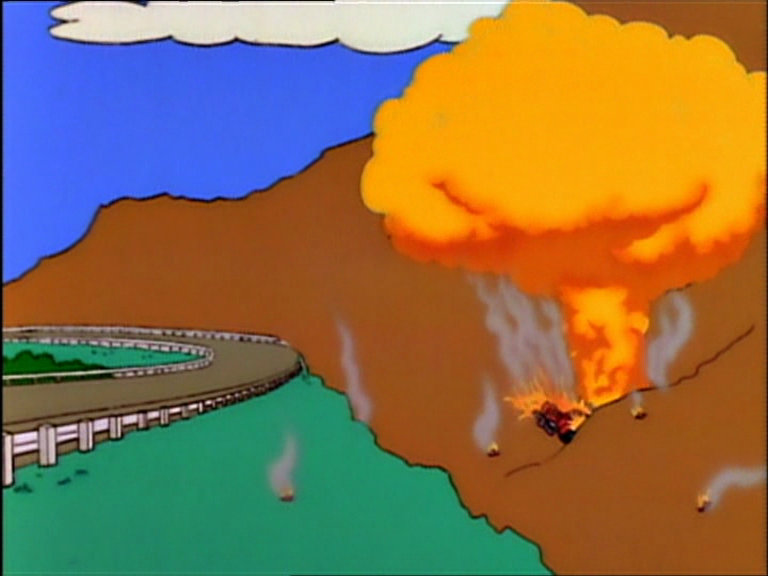 It’s in Season 4 that the idea of Springfield as “America’s worst city” starts to settle in. Every resident of the town is incompetent, corrupt or some delicious mixture of the two. That means that the Simpsons don’t stick out as much as they used to – the Season 1 idea of them as a broken family incapable of fitting in seems almost quaint by this point. They’re unmistakably a product of their surroundings. 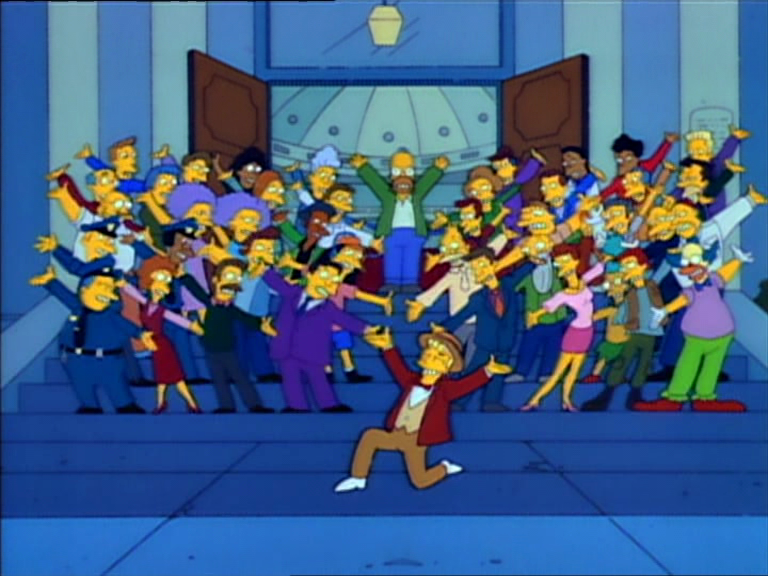 As the background extras start to become characters in Springfield’s foreground, the pacing of Simpsons stories has to adapt in kind. Episodes are much better at cutting between disparate stories in a single episode, and subplots running alongside the main story start to become the norm. This is sometimes used to create a point of contrast between two sides of a plot – Homer a toasty cinnamon bun at home in bed, the rest of the family freezing at church – or as a way of reaching two audiences inside a single episode – Bart and Lisa trapped at Kamp Krusty, while back in Springfield Marge and Homer get horny. But mostly, it’s used to squeeze in more jokes. Probably the single best example of this is “New Kid on the Block” (4.8) where the A-story has Bart developing an unrequited crush on his new neighbour. But the real star is the B-plot, which is completely unrelated. Seriously, without checking, can you remember what the other half of that episode is? While you’re remembering, a quick bit of trivia. This was the third B-story that Simpsons newbie Conan O’Brien wrote for the episode. The first had Homer getting into a feud with real-life comedian Don Rickles, who turned down the guest star role. The second was about Homer discovering a talent for hairdressing, an idea that was rejected and eventually picked back up in Season 22. I mention this mostly because it’s a fun fact (and to prove it’s not just Tim who can bring the trivia around here), but also because I think it illustrates a point: the two halves of the episode are so disconnected that they’re essentially interchangeable. You probably just heard Phil Hartman’s voice in your head, didn’t you? It’s possibly the single funniest delivery of a line in television history, and something I’ve said on a roughly fortnightly basis since the first time I saw that episode. Season 4 is the point where The Simpsons becomes ridiculously quotable. Becomes what, twenty years on, we would understand as a meme-and-GIF machine. Seriously, search Giphy for basically any word in the English language, and you’re almost guaranteed to see a yellow cartoon person giving voice to the idea. This is partly a factor of how beautifully crafted the jokes are – there are plenty of stories of the writers working nightmarish hours to perfect scripts – but partly it’s a sheer numbers game. Every episode here is stuffed with jokes, as many as will fit without tearing the seams. I mean, “dental plan” and “the blurst of times” are in the same episode (4.17). It’s just relentless. To severely overextend an analogy, the pace of jokes is like Lyle Lanley’s monorail – hurtling along a track at breakneck speed, just about holding together as it jumps between scenes and concepts… until, suddenly, it stops. Among all those jokes is the introduction of one of my absolute favourites: stuff exploding for no reason. This happens in about every third episode this season, and is indicative of a wider shift towards more extreme humour. Not so much in the edgy Family Guy or South Park sense – although there is a little of that, like the New Orleans musical number in “A Streetcar Named Marge” (4.2) – more that everything is so overblown that you’re laughing at the audacity. The kind of jokes that provoke that Marge Simpson laugh, where you cover your mouth guiltily as you chuckle. It’s an immediate change – in “Kamp Krusty” (4.1), you get Mr Black toasting three teenagers with the words “gentlemen, to evil” and later making his escape via hydrofoil. Or the Flanders pursuing Homer with their cheery hymns, eventually becoming a full-blown car chase. Or, yes, stuff randomly exploding, whether it’s Wiggum in a Duffland stein costume (4.16), a tree falling onto Jebediah Springfield’s log cabin (4.12) or Bette Midler throwing a littered can at the car it came from (4.22). Sometimes, I suspect it’s not just McBain who exists in an action-movie universe. I suspect Season 4 is where I first came in, with the BBC Two reruns in the mid-to-late ‘90s. The show feels ‘right’ to me here. The characters’ voices have mostly settled, and everything looks pretty much the way it does in my memory. Which, I should note, is beautiful. Partway through this season, The Simpsons changed animation studios from Klasky Csupo to Film Roman, which it would stick with until 2016. 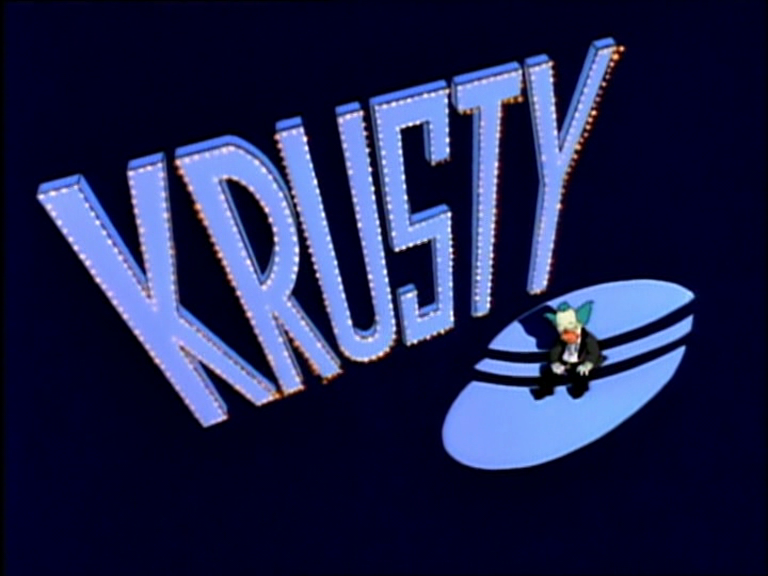 The results are really visible by the season finale, “Krusty Gets Kancelled” (4.22), from the angular Soviet cartooning of “Worker & Parasite” to Krusty’s incredibly expressive “Send in the Clowns” performance. But it’s worth acknowledging that, from here on in, there’s a certain amount of nostalgia at play. Not so much from the first time I saw these episodes, but from the years of rewatching and repeating lines in playgrounds and pubs. I said at the outset that I was trying to figure out whether the narrative of The Simpsons’ ‘golden years’ was accurate, and where that began and ended. I think with Season 4, we’re just starting to enter that period, but I have to admit that my judgement might be clouded. We’ve now reached the point in The Simpsons where every episode is imprinted on my brain, so I laugh a full second too early at a joke’s setup, as my memory fills in the rest. It’s all I can do not to say the punchlines out loud. It must be hell to watch any of these episodes with me. And, friend, that’s only going to get worse. Bart & Lisa go to a corrupt and dangerous summer camp, while their parents get their lives, libidos and hair back. Springfield is conned into building a monorail, which immediately breaks down with Homer and Bart aboard. Homer has to get a cheapo heart operation from the dangerously unqualified Dr Nick. Homer sets up a snow plowing business, but comes to blows with Barney when he sets up his own. Marge plays the lead role in a musical, to Homer’s boorish disinterest.